ysabetwordsmith | Poem: "Massaging the Heart"
This poem is from the February 2, 2016 Poetry Fishbowl. It was inspired by prompts from chanter_greenie, janetmiles, and Shirley Barrette. It also fills the "runaway pet" square in my 11-3-15 card for the Disaster Bingo fest, and the "hurt/comfort" square in my 1-4-16 card for the trope_bingo fest. This poem has been sponsored by Anthony & Shirley Barrette. It belongs to the Polychrome Heroics series. Paulina found herself falling back into Afghanistan. and the drone of choppers approaching. The smell of smoke stained the air. the group kitchen of which reeked of burnt macaroni. when he realized she was more aware. "I don't know," Paulina said miserably. she fell apart all over again. She curled up in the quiet room and cried. and swept the premises from top to bottom. Flopsy did not reappear despite their efforts. the courtyard outside the building. ten feet from the door, asleep in a sunbeam. when called -- now that she could hear it. then Paulina finally began to recover. but she liked petting the cat. the next best thing to boneless. and purred, loud and deep. put out some fresh cat food. but she could make it more bearable. Paulina Contreras -- She has light brown skin, brown eyes, and straight black hair to her shoulders. Her favorite color is olive green, such as her "Believe in Heroes" t-shirt from the Wounded Warriors Project. She excels at spotting patterns and imagining how things will turn out. Paulina has PTSD from her service as Airman First Class in Afghanistan, primarily from heavy gunfire and explosives. She does not deal well with loud sudden noises anymore. To cope with this, she has a therapy cat named Flopsy. As long as she's holding the cat, she feels relatively okay. Paulina is working hard to overcome the trauma and hopes to go into civilian search and rescue eventually. She is currently taking classes one at a time at Loyola University. 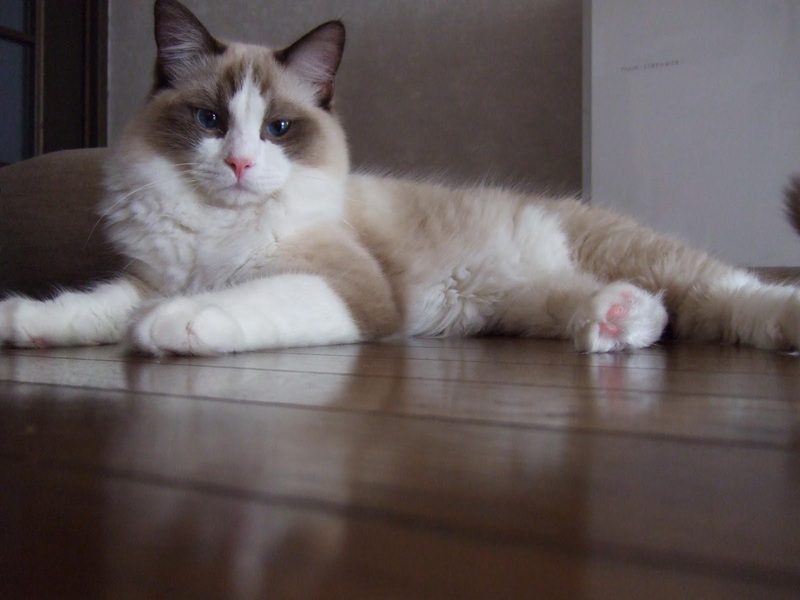 Flopsy -- She is a Ragdoll cat, primarily light brown with white face, underbelly, and feet. She weighs 15 pounds. Flopsy is gentle, compassionate, and wise. She loves people and enjoys lying in someone's lap or draping over shoulders. She is smart enough to walk on a leash. As a therapy cat, Flopsy belongs to Paulina Contreras and helps soothe her PTSD. Timone Evans -- She has medium brown skin, brown eyes, and curly brown hair. She is homosexual but bisensual. Her favorite color is pink, especially the deep hot pinks that look good with her bold coloring. Timone served as a Staff Sergeant. She has extensive burn scars across her chest and belly, with a few others scattered beyond that, from an incendiary device. They impair her flexibility a little, although she does exercises to minimize those effects. This scarring has wrecked her body image, and she has trouble feeling beautiful now. She keeps trying different ways to fix that problem, such as buying herself a pair of diamond stud earrings. PTSD is common in veterans. Understand how to overcome it or help a friend with PTSD. Flashbacks are a primary symptom of PTSD. Know how to manage your own or help someone through a flashback. Mood swings and other emotional problems are typical of PTSD. Various treatments are available. There are ways to control your mood swings and improve your emotional health. Also know help a friend through an emotional crisis. 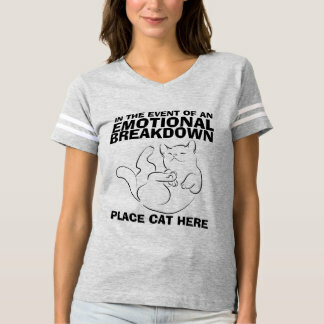 Paulina's cat t-shirt looks something like this. Cats make effective service or therapy animals for certain conditions, such as PTSD. They have many healing qualities, especially the purr. A good therapy cat needs particular traits. T-America has more advanced parameters in this regard. Service animals are mainly about actions; therapy animals are mainly about comfort; and both are protected for the benefit of individual owners. Animal therapists are highly trained in emotional support and provide comfort to clients in institutional or professional settings such as a hospital or counselor's office. The requirements for assistance animals like these include: good health, public manners, obedience to commands, control (like walking on a leash or riding in a crate), and performance of specific tasks. The primary determination is whether or not an animal makes a material improvement in a person's ability to function. It is not tied to breed or species, although some are far more popular than others, and there are recommendations on which animals do best for what conditions. Read about certification for therapy cats. Cats can be trained to do things such as come when called, walk on a leash, sit, enter a carrier, or close doors/drawers. Flopsy can do all of those, and is further conditioned to provide comfort when Paulina is upset or demand attention when she is despondent. But Flopsy is still a cat, thus occasionally distracted by open doors and cozy sunbeams. Learn how to train a cat. They head outside armed with a lighter and hairspray against zetetic bugs! I'll probably have more feedback after my emotions settle a little more. :D Yeah, this is probably after the "air raid" scene with berettaflies in the courtyard that I haven't written yet. I'm glad you enjoyed those parts of the poem. Timone should look into tattooing. It's getting popular with breast cancer survivors who don't opt for reconstructive surgery, but I've seen some spectacular ones covering up other surgical scars. That's not a bad idea. I'm not sure how well it would work for extensive battle damage, but a skilled artist might be able to turn it into something interesting. The best examples I've seen have tended to incorporate the skin's unique qualities into the composition. Gracious... she and Ashley could easily pass each other on the street! I mean, SPAZMAT and the hab, are within a block of where she goes for classes! And yeah, everything's better with kitties. Hmm... I wonder if a pet collar with a tracking device might not be a bad idea for her... cats are notorious for wandering after all, and meltdowns can happen anytime. That's not a bad idea. I suspect that they haven't thought about it because T-American folks consider location to be private information, which makes them far less inclined to put trackers on people or animals. They will put trackers on inanimate objects like city bikes, though. So a collar would be logical. Flopsy really isn't a runner though. Most indoor cats that make a mad dash for freedom are inclined to go exploring. She literally rolled over for the first sunbeam she found. LOL Most of the time Flopsy is very easy to find. She's kind of like a cushion that purrs. You know, if Flopsy is as trainable as most ragdolls, you might not need a tracking device. A simple one-way communicator, something that would relay a spoken command to her, and train her to head to a particular point upon command. Like "food" or "Treats" for example... and feed her in the same place each time. Works for my cats after all. [although the 'communicator' is me yelling] Granted, I also have a gps tracker and a 'radar' app on my tablet, but that's more for my peace of mind than anything. and Flopsy might not be a runner, but I bet she'll find a box or something and go to sleep in it from time to time. ..and now I'm also trying to imagine Asheley and Paulina meeting. Hmm, all things considered, Cpt Perez probably knows her, or knows of her... but I can't think of a reason why they would... Unless, Well, Ashley has PTSD, not from combat but from during/after hurricane Katrina, compounded by more recent events. That would make sense. Yes, Flopsy is trainable. Not highly energetic, but very devoted. One of T-America's groundrules for assistance animals is that they have to be trained for specific tasks and perform reliably. The details are left flexible because people need different things. LOL yes. The only reason Flopsy didn't come earlier is she was outside and couldn't hear people searching for her. Touche. That's why she is trained to come when called. The most obvious is simply that Easy City has a bunch of stuff centered around the berettaflies right now. Group therapy sessions for the communal trauma; obviously both SPAZMAT and Loyola will be running some of those. Safety lectures on zetetics, emergency gardening, etc. EFA presentations on how to recognize and address stress symptoms in yourself or others. Citizen discussions about appropriate ways to handle supervillains, minimize threats from zetetic weapons, etc. Ashley is a berettafly survivior and Paulina went after some of them with a can of wasp spray. (That's one of the pieces I still need to write.) It is not impossible that they should meet. Feel free to borrow the characters I have in play within this city. Something else useful: Paulina and Timone for sure, and possibly some of the other veterans, are thinking about proactive tactics. The foaming wasp spray worked. It is a potent insecticide designed to travel a long distance, incapacitate dangerous bugs, and kill them quickly. Berettaflies are harder to kill than ordinary insects, but a direct hit from wasp spray will kill them and a glancing blow will probably knock them off balance. And of course, they're flammable, hence the hair spray flamethrower. Flopsy has facial markings very similar to our Spike. Who is named after the rose goblin in the Toby Daye books, not the vampire from BTVS. Ahh, therapy cats. So very awesome when they're...actually useful. Which is most of the time, except when they're not. I speak from experience, as my Loiosh as TOTALLY saved my life a couple times, & then there are the times I'm tempted to duct-tape him to the ceiling & leave him there for a while. Fortunately he doesn't believe a word I say, so usually just threatening him is enough to trigger my sense of the absurd without bothering him a bit. He is, after all, a cat. :D Well, they are still cats. Honestly, I have heard people say the same of their human therapists. Thank you so much for this. Cats ARE amazing. Personally I find nothing more comforting than the soft weight and velvet fur of a cat or kitten. And they want to help. Wouldn't they be worried about Flopsy getting outside if there are Berettaflies about? I'd be really worried the Bflies would harm Flopsy. Agreed, cats are very soothing. Yes. In addition to the ordinary hazards that make people prefer to keep therapy cats indoors, the berettaflies are an additional risk. Thick fur might protect against casual contact, but not against sniffing one. I'm sure the residents will sit down and have a talk about the need to keep everyone's widely assorted assistance animals inside. For people who didn't grow up with pets, the door-watching and door-guarding activities simply are not automatic. Good! I didn't mention the general safety reasons for keeping cats indoors but it was on my mind. I focused on Barettaflies as a real threat to a small creature like a cat. And I'm glad that people will be more watchful. It's always one of my concerns when I have guests or others in the house who may not be used to the kind of precautions to take with cats. Like be sure they aren't inside the closet/cabinet/pantry before you close the door. close the electric garage door before you come into the house, etc. My kitty, Delphi, will NOT try to dart out past people- though some cats do. But if someone leaves the front door standing open she will get curious . ( Maybe someone ran out to their car and didn't think to shut the door) I kind of see Flopsy in that category. She's not hovering around people's feet trying to escape, but if a door is left open awhile or not latched properly she'll get curious and may wander out to nap in the sun or chase a butterfly. Pet parents may worry more If they're physically disabled and can't move fast to intercept a curious kitty or otherwise head off a problem. ( Not sure that Paulina is but it's a factor sometimes). And people who don't know a lot about cats may think if she's not trying to run past them she's not interested in outside at all and get a little careless with the doors. So it's good that the housemates will have that talk about keeping Flopsy safe. AnywayI loved this so much! Love all your writing, Avengers and original, and I especially love when you write cats in the mix! Have you written about Flopsy before? Would love to read her origin story. I've always loved the idea of the Avengers adopting a cat. They'd benefit so much from a therapy cat or even the love and security of a "regular" cat (Cats are never ordinary). :-). My worry in this scenario is if enemies brought a fight to the tower, how to keep kitty safe. But it is still such a secure building; don't you think JARVIS could manage something to protect the kitty in an emergency? Anyway I'd love to see this. Especially after The Battle of New York when everyone is so Broken. It would work for it to be a rescue kitty. Maybe rescued off the streets rather than a shelter-'first seems more likely for Avengers. Someone would have to give them a shelter kitty or recommend it and I don't see them going along at that stage. But an Avenger coming home with a little fluff ball having saved it from danger in the streets- That would work. Maybe a kitten would help Clint sleep through the night. Or having a small sweet life to care for would teach Bruce to take breaks and help him learn to care for himself. Steve would have a companion; a perfect listener to help him through his grief over Bucky and losing his whole world. It would nap in his shield. A kitten would be able to earn a real laugh or giggle from Natasha, and allow her to explore softer feelings- or feelings at all. The kitty would bat at Thors hair and play bite his ears. I am least sure what a kitten would do with Tony or for Tony, but I suspect he'd pretend to want nothing to do with it at first ( maybe trauma or a bad memory of childhood pets and Howard or always wanting one and not being allowed so now he's armored against it) But he loves it secretly and sneaks it down into his lab late at night. The kitten is the only living creature Tony confides in about his PTSD, his torture in Afghanistan and some of his other worst memories. Things he wouldn't even tell Pepper. He makes an awesome kitty condo for kitty to nap on in the lab or otherwise creates awesome kitty gear and toys. When the team finds out no one is Actually shocked as they've started to see through Tony. And he reaps positive benefits like better sleep and self care. He's loved unconditionally for the first time in his life In fact I think that's true for all but Steve and Bucky. And Bucky- oh, Bucky. He'd probably be scared of losing himself and hurting the kitten. But if he was reassured enough by Sreve to try holding and stroking the kitten, playing with it, he would actually start to have better control of his mood swings. (I know Bucky's condition is complicated with amnesia and State dependent memory). He might need a spotter with the kitten but it would help relaxation, lower his blood pressure. It would be a positive connection with Steve and might help open other positive memories( like therapy cats in nursing homes- patients with Alzheimer's or other dementia can have very positive responses to an animal. Or autistic children, otherwise mute, will speak to a therapy cat or dog). Later on he could confide in the kitten, like Tony. Caring for it could help with his sleep and self care issues like Bruce and Clint. Maybe it would need to be a pair of kitties or a trio, to have these interactions with everyone. Or maybe one particular Avenger brings the kitty home to the tower but it bonds with and helps all of them. Sorry for long comments. I dont mean to be a bother. But guess where my own furry angel is? She comforts me more than anyone or anything else I know. That was me above- tresta.. I'll,try to sign in here. I didn't mention Phil and the kitten, but a I think Phil is a cat person . He sees that the kitten is sort of an "assistant" therapist and lets it carry on. The Avengers think they are just playing with a cute kitten, maybe not realizing how much that kitten is helping. Phil smiles his enigmatic little smile and doesn't spill the beans. The first time Clint sleeps through the night, or Tony comes up,for a meal without prompting, Phil buys his partner some fresh salmon. He can neither confirm nor deny that the kitten spent that night curled up among his suits. I have seen some good examples of this in fanfic. It wouldn't be any harder for him than protecting two-legged residents. Stark Industries is obviously an inclusive company, and it's huge, so there's probably someone in the building with a guide dog already. Steve was always protecting strays; it's been mentioned before. Natasha has a pet! She picked out a tarantula. She doesn't want something to cuddle. She wants something to watch kill things. It makes her feel happy and safe. And listening to the crickets chirp makes Bruce feel safe too. Phil is ... coping. Plus the fish, of course; Bruce and Betty's idea of animal therapy was installing a goldfish tank in the common room. Like the tarantula, the fish stay put and are easy to keep safe. Yyyyyeah. He's touchy about that. Aww. In fact, Phil has animal background because of his sister. Yeah, that varies. Some places are more or less dangerous; some cats can take care of themselves while others are basically defenseless. Flopsy is so languid that she wouldn't make a good outdoor cat. Plus of course, any assistance animal is more valuable than a random pet and may be needed at any time, so it's more important to keep them indoors. Whole different job than a barn cat, for example. Those are good topics to cover too. Feel free to prompt for it some time. Flopsy is neither an escape artist nor a runner. But like you said, cats are curious. Paulina is not physically disabled; she has PTSD. However, there are several residents in wheelchairs, blind, etc. They need to learn enough unit cohesion to keep everyone's assistance animals indoors. Once they recognize this as a perimeter-control issue, they'll count it as important, and then it's just a matter of practice. I have mentioned Flopsy before, in "Always Something Beautiful," but it's not exactly an origin story. If you want more cats, though, just ask! Paulina has a Ragdoll because she needs a calm cat, and there is nothing more mellow than a Ragdoll. They don't mind being hugged, carried around, cried on, etc. Agreed. They're more talkative too. Aww. And yes, purrs are good for soothing nerves and knitting broken bones. Smart cats can indeed learn to open doors. Then of course there is "Mrrrp the Magnificent and the Reinvention of the Lever." Our permakitten Cricket (tuxedo moggie) is more talkative than Destra (she chirps, thus, Cricket), but raggies are (from what little I've seen of them) pretty quiet, yes.